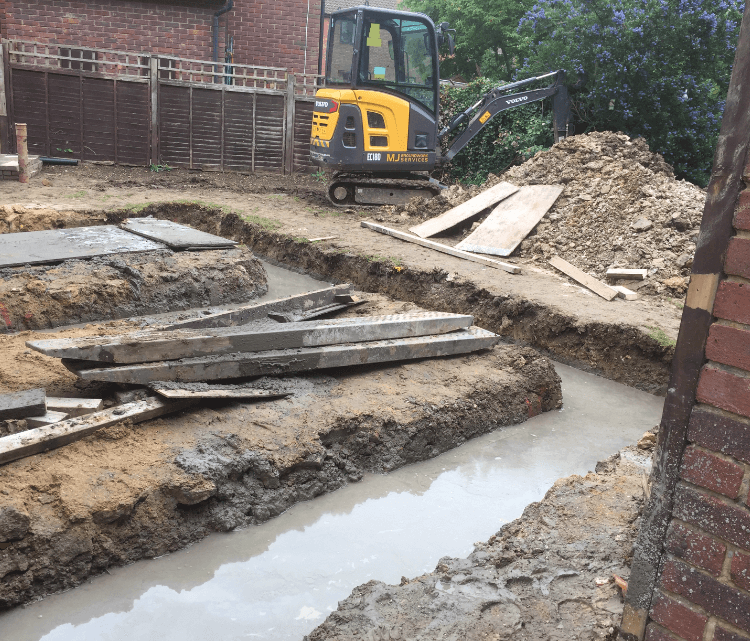 At M J Groundwork Services, we provide a complete groundwork service for our clients in Theydon Bois, Chigwell, Romford, Brentwood, Epping, and beyond. Our team of experts do all the heavy work – lifting, carrying, digging, and so on – while you sit back with the knowledge of a job done well. However, some of our clients in the Hertford and Essex area have their heart set on completing their own project from the ground up, be it a new patio, a home extension, or installation of a swimming pool. For them, they have the resources and their own team to do the work, but they need the use of some heavy machinery to get the job moving. Fortunately, we have the solution for them. 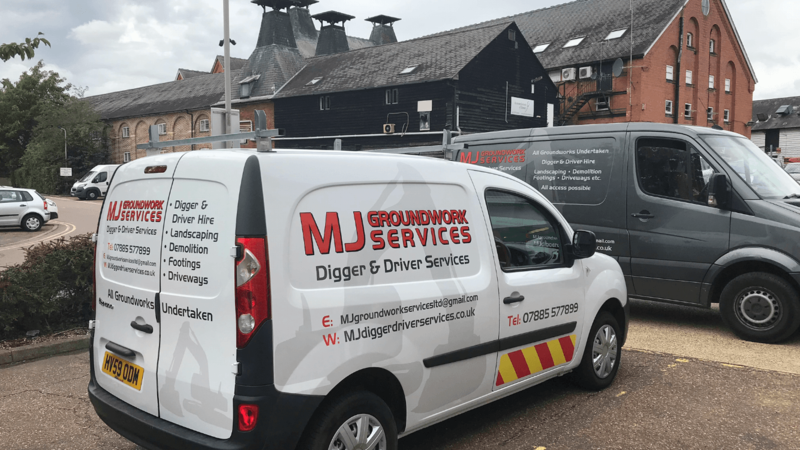 Digger hire and mini-digger hire packages from M J Groundwork Services give you all the advantages of having some of the best and most efficient digging machines at your disposal, while still allowing you to be in control of your building project. Our digger hire and mini-digger hire packages include your choice of machine from our extensive range detailed below, as well as a member of our highly skilled groundwork team to operate it. You can arrange for when you want it, and for what duration, and both the machine and its operator will be available for your use during that period of time? Can I operate the digger myself? Regrettably, this is not a service that we offer. All of our digger hire and mini-digger hire packages include an operator hand-picked from our team of trained experts. Both diggers and mini-diggers are difficult to operate without adequate training and can be extremely dangerous for the user, bystanders, and the construction site if not used correctly. What models of digger and mini-digger do you have available? The Volvo EC18D is a top-of-the-range compact excavator. With a cast iron, high performance counterweight at the rear, it is capable of being operating over the most uneven terrain, making it ideal for landscaping purposes. Though it comes with the excavator as standard, it can be fitted with a number of attachments, if needed, making it the ultimate multi-purpose digging machine. The JCB Dumper is a useful tool if there is going to be substantial groundwork involved in your project. With a broad dumper bucket moving or disposing of topsoil and other site waste during clearing, it could not be simpler. With a tight turning circle and intuitive controls, it can manoeuvre well in even the tightest conditions, despite its bulk. Coming from one of the country’s most recognised construction vehicle firms, quality and reliability is guaranteed. The Takeuchi Micro Digger is small enough to fit through a regular doorway, but do not be fooled by its size. Extendible tracks give it extra stability whilst digging, and its powerful engine gives the machine a fair turn of speed, whilst losing nothing in terms of strength and functionality. Ideal for the compact building site. We also have a range of other dumpers and diggers, from 1 to 3 tonnes. If you’re not sure what’s best for you, give us a call and let us help you choose the best model for your situation. Our team is based in Sawbridgeworth, Hertford, on the border with Essex. We operate across an area of some 40 miles, providing essential digger hire and mini-digger hire packages to our valued customers in Theydon Bois, Chigwell, Romford, Brentwood, and Epping, as well as further afield. Since 2014, we have been providing digger hire and mini-digger hire services to our clients in Epping, Brentwood, Romford, Chigwell, Theydon Bois, and across Essex. Our operators (whose services are included in the package) are well-trained in the use of all our models, and have over fifty years’ experience between them, so you can be sure the machine will be handled with the utmost care and precision. 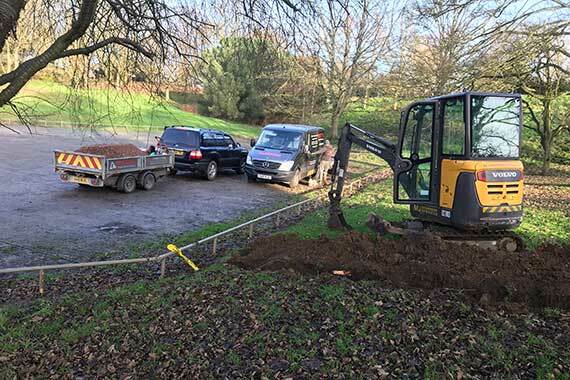 To arrange a digger hire or a mini-digger hire with us, simply call up M J Groundwork Services today on 07885 577 899, and speak to a member of our friendly and professional team. They will run through all your options before providing you with a free, no-obligation quote.